Combined with our print marketing solutions, digital opportunities from Athletic Business connect your brand to our audience of buyers 365 days a year. We have the digital engagement and list integrity you need to drive your message to the decision-makers you are targeting. Athleticbusiness.com is the perfect bridge to unite your print marketing to your digital marketing. With over 2 million+ pageviews from annual visitors, our website is the leading digital platform for your company to increase brand awareness, drive new leads and maximize your marketing ROI. Want to see your company featured online with the rest of the industry-leading news, trends and content found on athleticbusiness.com? Position your company as an expert in the industry and leverage the power and trend of 'Content Marketing' – all with Athletic Business. Digital Sponsored Content is a cost-effective marketing platform that allows you to separate your brand from the competition, engage with prospects in an educational way and drive the value of your brand to new heights – all using the power of a "story" to help tell your brand message to our audience. 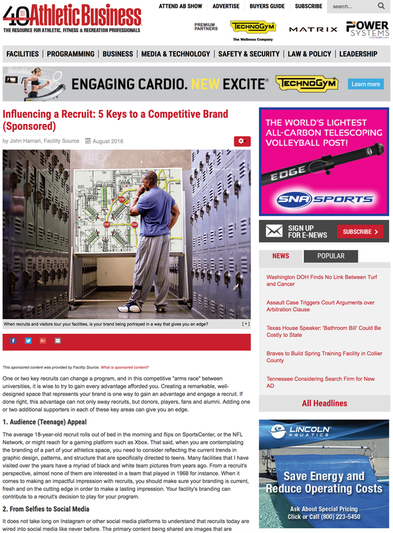 Sponsored Content Example on AthleticBusiness.com from Facility Source. ​E-Newsletter (Monday-Friday) targeted to 43,000+ industry professionals who look to us for the latest industry news, products and insights from the athletic, fitness and recreation industries. Get access to our dynamic and robust audience of 41,000+ digital subscribers with Custom E-Mail solutions available from Athletic Business. Use this marketing channel to drive new leads to your website and target those who are not already in your CRM. Reach AB's social media audience with a sponsored social post. You provide the image, link and copy and we'll share it with our engaged social media connections. Get your message in front of potential customers instantly. It's the new word-of-mouth – you're not only reaching the AB audience, there is potential for your message to be shared, being seen by thousands more. Athletic Business offers a very limited number of sponsored social media posts – allowing your message to stand out. Drive 24/7 Visibility and Showcase Your Company with Customized Microsites from Athletic Business. Our microsite solution is a cost-effective way to jump-start and optimize your digital marketing strategy. As an extension of our industry-leading Buyers Guide, Microsites allow your company to showcase product videos, photos, catalogs and more – all while being hosted on athleticbusiness.com and be seen by our more than 2 million website visitors a year. ​Discounted microsite rates are available for Buyers Guide print advertisers. Are you an architect looking to drive more visibility, showcase your projects and reach more facility builders? 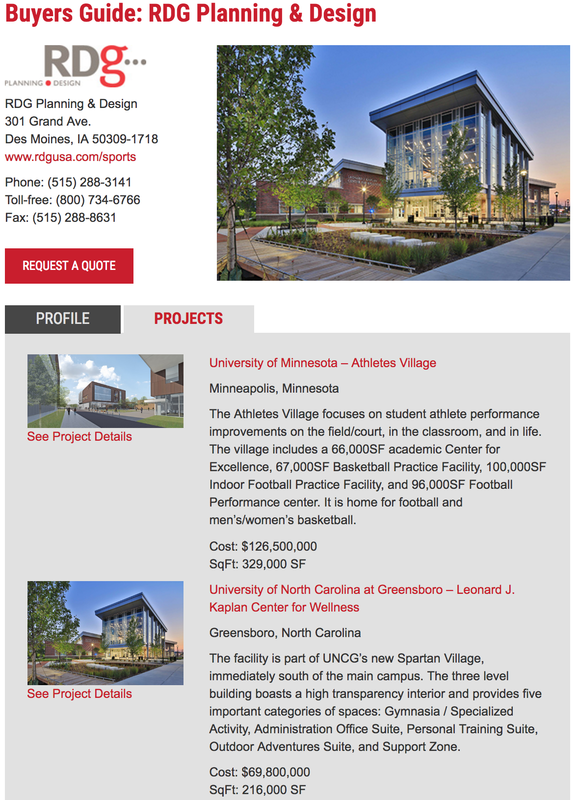 If so, the Architect Portfolio from Athletic Business is your solution. This cost-effective digital marketing tool is the digital extension of our industry-leading Buyers Guide, allowing your firm to showcase your latest projects, profile and Architect Showcase submissions to our 2 million+ website visitors a year. Discounted Architect Portfolio rates are available for Print Buyers Guide advertisers. Increase the reach of your marketing videos and gain additional exposure with video promotion available through Athletic Business. Video is great for telling a more detailed story in a visual, engaging way.